You are here: Home / grief / What Advice Do You Have When Caring for a Child After the Death of a Family Pet? For many children their first experience with death is the loss of a pet. Although it is devastating for children of all ages, it does allow them to understand the process of death and grieving. They observe the deceased will not be coming back and find a way to cope. 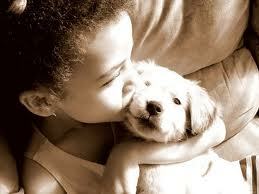 If a pet has to be put down, it is best to allow the child to say goodbye first. Give them truthful, uncomplicated answers about the process and help them remember the positive impact the pet made on their lives. It the pet is buried, plant a tree, flowers, or a marker in the yard in tribute. If cremated place the urn on a bookshelf or mantle with a photograph or collar but make sure not to turn it into a shrine to the lost pet. It is important they feel the loss and move forward instead of replacing the pet with the shrine. This is also why you should not replace the pet immediately. There are many helpful books for children addressing pet death. Some of the most popular are: Newberry winner Cynthia Rylant’s Cat Heaven and Dog Heaven I’ll Always Love You by Hans Wilhelm, and The Tenth Good Thing About Barney by Judith Viorst. Compassion, the passage of time, and books like these can help heal a child’s broken heart. You list some very great advice, and I have started to advocate that people use the pet death as a way to start dialogue about death in general. Or even if it happens to be a wild animal you come across in the woods or a park. Or if an animal they know from a zoo has died.Death happens to every living thing sooner or later. And creating fantasies or lies just really confuses kids. My charges recently had their 16 yr old pet cat put down because his body was failing. And they had watched him decline. They also did have a pet dog die a few years ago. And both's ashes are in urns on the mantle. They also hung symbolic Christmas stockings for them.The younger one bought a locket and had MB print small photos of both pets to go in it. With me we beaded a necklace with the pets names and their fur colors as choices for beads on it. Last weekend they went to Build A Bear and the younger one built a cat, that yes looks like the one that died. I also have cat fabric that we will sew into memory pillows soon. I think it's up to the parents. It's the parents decision on how you should discuss death with their children. If the parents want you to tell them the family dog is at a dog farm running around happily, instead of the truth, that's their choice and you must respect their wishes. One family brought the cat back home to say goodbye to everybody and that mother and I said "never again!" No way will I ever do that because the kids felt if they could stay up later, never fall asleep and sit with her forever she wouldn't be killed. It was a disaster. Parents could possibly take their kids to a pet loss grief counseling support group for them to realize that they aren't the only ones who feel such things for their pets.